May 2003 was a momentous occasion in many ways. We produced the UK's first national anti-bullying conference for young people with the I Power I Crew and we introduced a great young talent on to the national stage. She is called Lhamea Lall. Lhamea was 16 when she first performed at the I Power I National Anti-Bullying Conference for Young People but she already had a very mature head on her shoulders. Lhamea also possesses a voice as sweet as honey with the power of a jet engine. Lhamea was an unknown talent to me then, she took the stage to warm the audience up in preparation of the So Solid Crew. Lhamea went down a storm. She was young, good looking and sang from the heart. The heart is where its at with Lhamea. I had the pleasure of interviewing her for an anti-bullying resource film later the same year. Lhamea told me about the dreadful experiences she had with the bullies at her school. She lamented about how a school is supposed to be a safe space for children, but the school could offer her no protection. The school was no help at all, in fact after many complaints and nothing being done about the bullying Lhamea had to change schools. Lhamea epitomises the strength of Britain's young people. She had the strength of mind and the strength of talent to overcome the bullying she suffered and went on to achieve great things in her already young life. Since first meeting Lhamea in 2003 I have followed her progress carefully, she has two very supportive parents who back her to the hilt and are always there to help her in any way they can. Lhameas parents will regularly call me up to give a progress report on Lhamea or to let me know that she is appearing on the 10 o clock news and other programmes. In my opinion that is where Lhamea gets her strength from. She has two loving, caring and supportive parents. Through all the difficulties she faced they have been there for her. They are towers of strength and have been excellent role models for her. 2005 was another fantastic year for Lhamea. 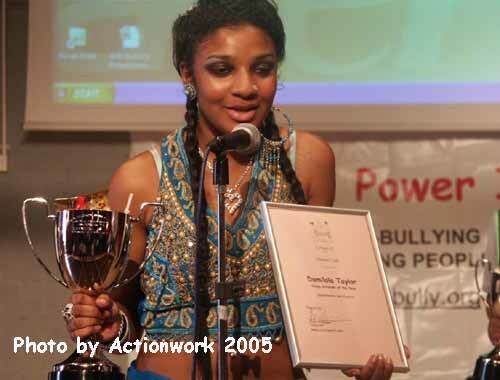 She again sang at the I Power I National Anti-Bullying Conference for Young People in July, where we awarded her the Damilola Taylor Young Achiever of the Year Award (Sponsored by Avon Salt). Lhamea and I, along with her parents, my daughter Sophie and the other Young Achiever of the Year Award winner Jamal Msebele, went for lunch with Damilola's father Richard Taylor several weeks after the I Power I event. Richard, a truly inspirational man himself, was so inspired by Lhamea that he invited her to perform at Damilola Taylor's 5th Memorial Event in remembrance of his son. 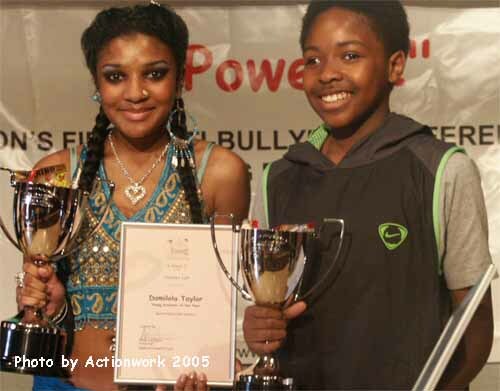 Lhamea worked with us again in 2006 at our national Anti-Bullying Festival where she presented the Young Achiever of the Year Award and sung to hundreds of young people. 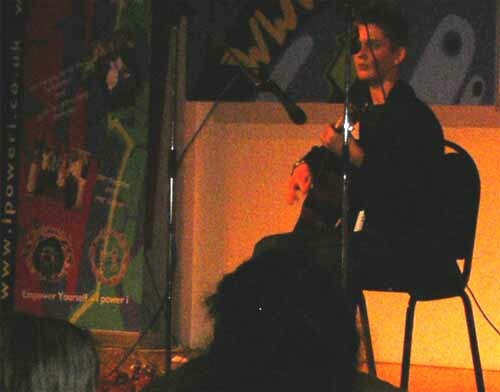 In 2006 ipoweri introduced a brand new talent to the stage. His name is Karl Griffiths. Karl, in 2006, was a 13-year old singer songwriter from Weston-super-Mare. Karl can easily be mistaken for a young man well above his years, he is a talented, mature young man who won the 2006 ipoweri national anti-bullying music competition. Karl won this competition in the face of stiff competition from young people based all over the country. Singing from the heart about some of his experiences of bullying that he faced at school, Karl won over the hearts of judges and audience members alike. Karl was chosen as the winner by a unanimous vote of the ipoweri young people at the Barcode Youth cafe in Weston. Karl said: "It was a great evening at the Barcode, I was very pleased to win as I didn't expect it. Playing in front of all those people the next day at the ipoweri natioanl anti-bullying conference in the Winter Gardens was awesome, I really enjoyed it and met some really nice people. The whole day was amazing". Karl spent his £250 prize money on buying a new guitar. Since winning the ipoweri national music competition Karl has gone on to record his own CD what is available to buy (e-mail sally.henry@virgin.net for a copy). The CD costs £3.50 and profits go to charity. Karl has gone on to do several gigs, including another one at the Winter Gardens in front of the Mayor. Karl is an unasuming young man who has his feet firmly on the ground. His songs are deep, sung from the heart with very clear messages that don't preach or condescend. In his single 'Picked On', he talks about suffereing bullying, and that it is alright for boys to cry. This fantastic talent is a great role model and a wonder to work with. I have offered Karl several opportunities since the ipoweri event, including touring with Actionwork® delivering some anti-bullying creative workshops to schools in North Somerset. 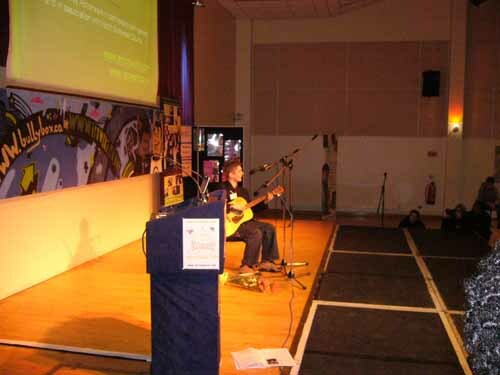 Karl assists in running the sessions, sings to the students and offeres advice on how to stop bullying. Karl is also happy to talk about his own experiences of bullying so that it may help other people. Karl is a joy to work with and an extremely talented person. he will go on to do great things. He has fantastic support from his family, who are very proud of his successes to date. If you want to support Karl, then please buy his CD. Karl is a great talent for the future. We suggested to Karl a new stage name, based upon his initials K.G. So to some he is now known as Kaygee. Return to Actionwork's staff page.